Thai TIffin Carrier or Food Carrier /Thai Rice Bowl Buddhist Style or Offering Food to Temple Monk Priest ;size 21 cm. Thai Rice Bowl / Tiffin carrier Buddhist Style or Food carrier Offer Breakfast to Temple. The Pot made by Aluminum with the beautiful Ancient Style Thai Design. 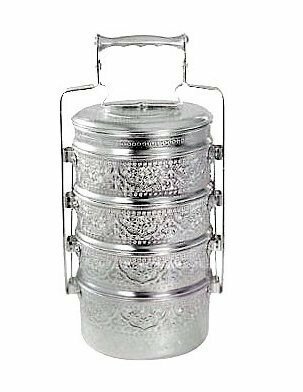 The Tiffin carrier is good for Buddhist People to use to contain Rice , fruit or any food to Temple you can use to contain Rice or any food for Serving in Thai Menu. You will received 1 set as shown on the picture. If you have any questions about this product by patcy_store, contact us by completing and submitting the form below. If you are looking for a specif part number, please include it with your message.